It usually starts in the spring. One day, you’ll go outside and suddenly you’ll notice large, grey bags made of thick webbing hanging in your trees. If you’re lucky, it’s just one, but sometimes it’ll be dozens spread across your yard. If you look closely, you’ll see hundreds of wriggling caterpillars inside, just waiting to get out. They’re bagworms, and they can destroy your trees in a single season. What exactly are bagworms? Bagworms are actually not worms, rather, they are caterpillars which will eventually grow into a moth. A female bagworm moth can lay up to a thousand eggs into the bag she has created. The eggs will remain in the bag until they hatch into caterpillars. After hatching, they will escape the bag, and begin eating anything they come across. On a windy day, the caterpillars can be blown to other trees and shrubs, which can spread the infestation. Eventually, they will grow into moths. Female bagworm moths cannot fly. They stay in place and weave a bag for the next generation, and males fly off to help spread the infestation. Bagworms are ravenous eaters and can destroy trees, bushes, flowers, and even gardens. They eat almost any arborvitae but will also eat maple, boxelder, willow, black locust, poplar, oak, apple, cherry, persimmon and just about anything with green leafy leaves. 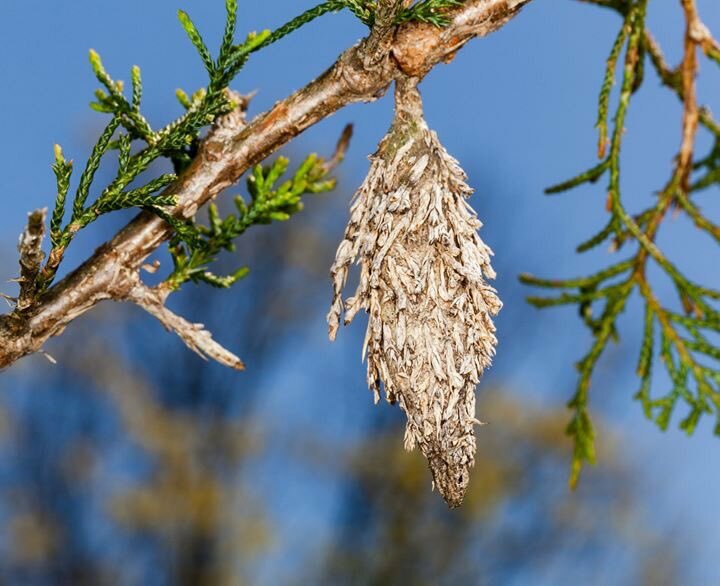 While a single bagworm infestation may not kill a large and established tree, it can significantly weaken it, leaving it susceptible to disease and further bug infestations. For smaller shrubs and newly planted trees, a bagworm infestation can be a death sentence. Bagworms can do thousands of dollars in damage to your landscaping over just a few weeks. Bagworms can be difficult to treat because in their pupae stage when most people first notice the infestation, they are not susceptible to treatment because their “bag” (actually a cocoon) protects them from chemical applications. However, catching them just when they emerge is tricky, and if you miss that moment, you’ll have a hard time ensuring that you’ve treated all of the caterpillars. Bagworms can have up to two seasons per summer, depending on whether or not they were laid early enough in the spring, so multiple applications of treatment may be necessary throughout the season, particularly if you don’t have experience with this type of treatment. Your best bet if you notice bagworms in your trees, or even close to your property, is to call in a professional to have the situation assessed and a treatment plan created that works specifically for you and the needs of your property. Certain landscape treatment companies, such as Aronica Plant Healthcare even offer organic options that can be used for bagworm treatment, but early treatment is key to the health of the plants in your yard. If you suspect bagworm or any other insect infestation in your yard, give Aronica Plant Healthcare a call today. They’ll make sure your plants are protected from bagworms and other pests that can ruin your summer.